We love Mexican inspired meals in our house. There's always taco shells and corn tortillas in the pantry and at least two cans of black beans, we have special taco plates and burrito bowl tins and every Tuesday is Taco Tuesday - without fail. This potato salad recipe was inspired by our love of Mexican food - but also created as the perfect way to use up the leftovers from our Taco Tuesday dinner the night before. I had leftover black beans, a bag of sweet potatoes and half an avocado so I decided to combine them, add some pilfered shallots from the herb garden and a can of corn kernels and hey whaddayaknow, I had a delicious lunch. 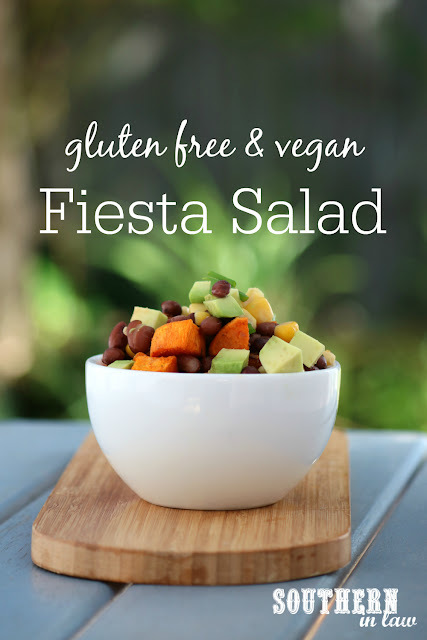 Lately, this salad hasn't just been a way to use up leftovers - it's become a meat-free meal that we absolutely love - and it's so simple to make (and easy to make your own!). And as for the name... 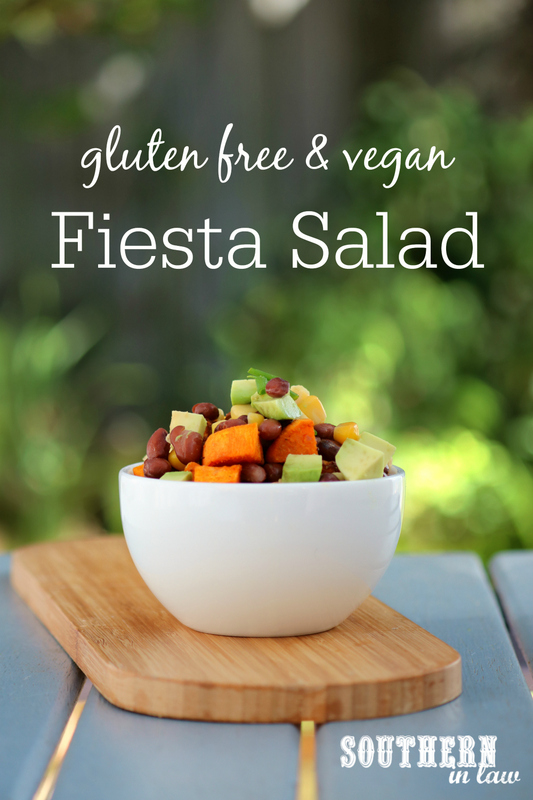 I don't really know why I first called it a fiesta salad, but the name stuck! Combine your sweet potato, oil, cumin and garlic salt (I usually add them all to a plastic freezer bag and shake it around to coat the sweet potatoes). Place your coated sweet potatoes onto your tray and bake until lightly browned and cooked through. Move your sweet potatoes around a few times whilst baking to ensure they cook evenly - and keep an eye on them! Baking time will vary depending on how big your pieces are. 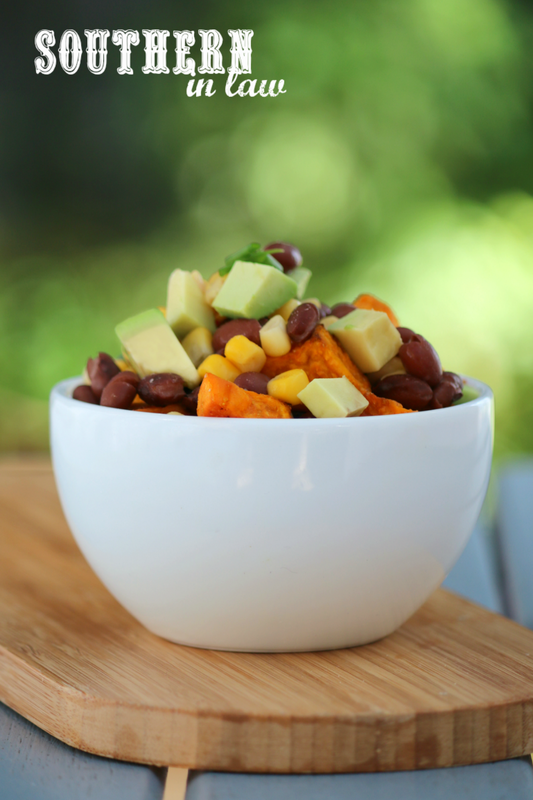 When your sweet potatoes have almost finished cooking, prepare your other ingredients and add them all to a medium mixing bowl. 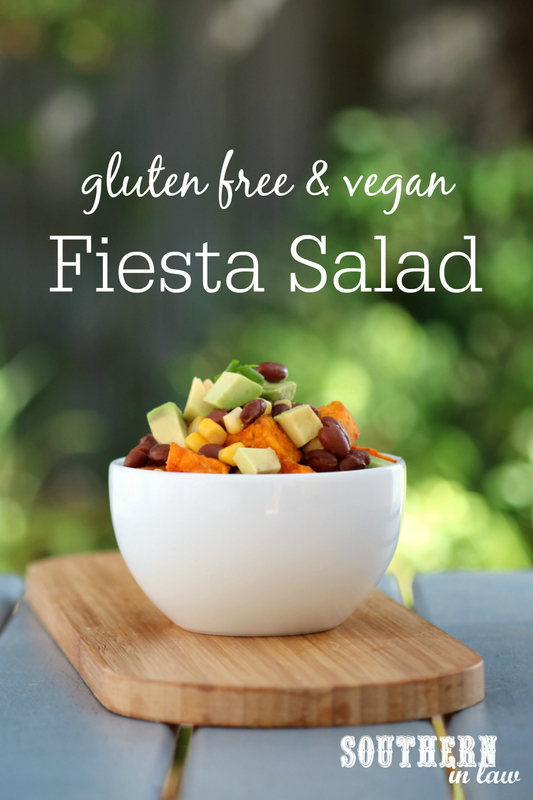 Add in your cooked sweet potatoes and toss to combine all of the ingredients. Want to add a little something extra: When making this salad for Jesse I also add in diced tomatoes and diced capsicum/bell peppers (I can't eat them myself). You could also add a little bit of chilli powder to the sweet potato seasoning for some extra kick! But tell me, are you a Mexican food fan? I don't think I can choose! Growing up in a multicultural country means that I've always eaten different cuisines. I don't think I ever really eat the same cuisine two nights in a row - I'll have Asian one night, Italian the next, Mexican another night and then Lebanese or Greek food for something different.